Brought to you by Kroger. All opinions my own. 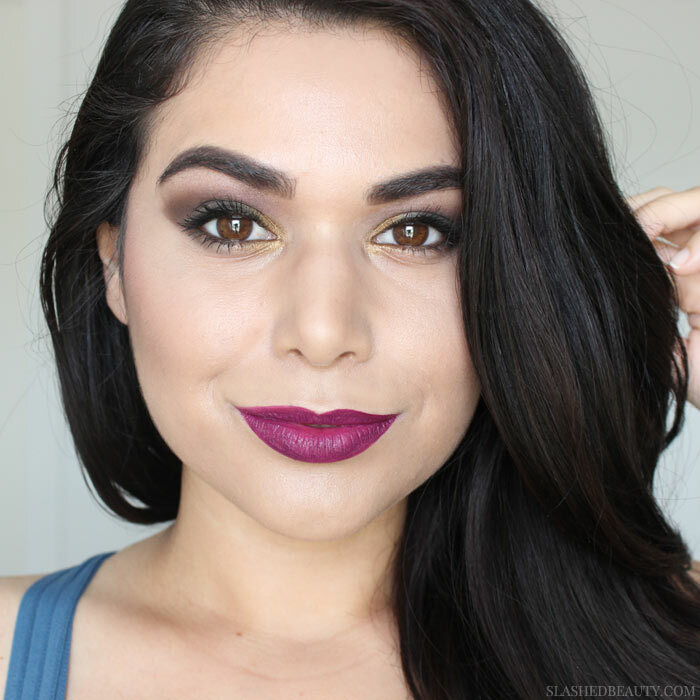 My fall makeup senses have been tingling, and I’ve been so eager to play around with smoky looks and jewel tones. I thought I’d grab some inspiration on my last trip to the grocery market… yes, you read that right. My new local Kroger (Smith’s) store actually has a really expansive beauty section, which of course I always take time to peruse on my way out. 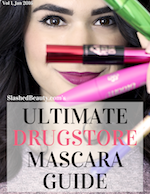 On my most recent trip, I was stoked to find out about their Beauty Event happening within the next few weeks— a ton of items are going to be available as Buy One, Get One 50% off in the cosmetics, hair and skin care sections! I’m ready to see all those yellow tags, ya’ll. The sale starts September 27th and runs until October 11th. Not sure what to pick up? 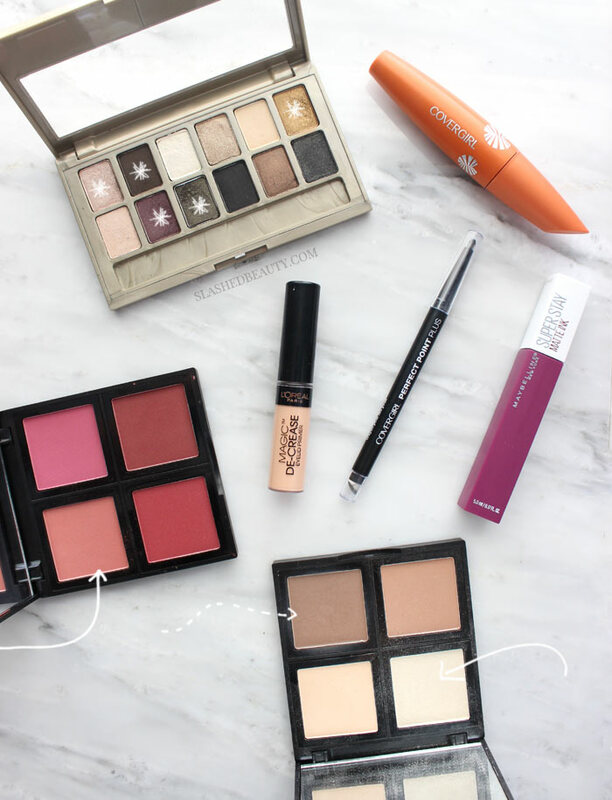 This budget friendly fall makeup look should get the juices flowing! All of the products I used were available in my Kroger’s beauty aisle at a bargain. My fall makeup looks usually read night-time or going out for those who aren’t used to heavier makeup, though you will definitely see me rocking something like this during the chilly-aired days. 1 | Apply eyelid primer all over the lid. 2 | Blend shade 1 from The 24K Nudes palette on the lid, all the way up to the brow bone. 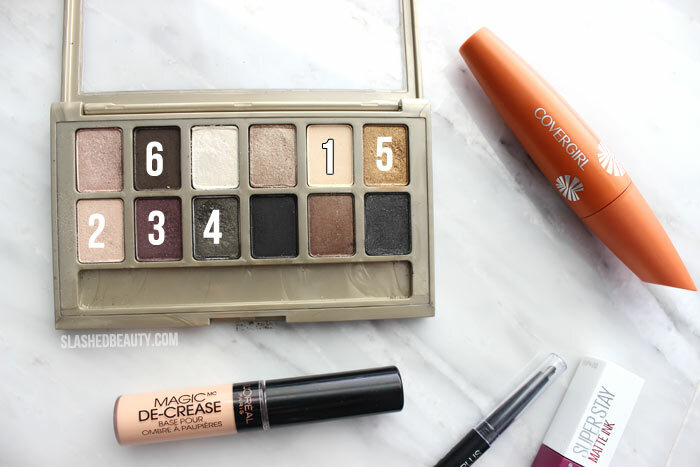 3 | Use shade 2 in the palette to highlight your brow bone. 4 | Apply shade 3, the purple mauve, in your crease and blend upwards. 5 | Use shade 4, the deep green, and apply to the entirety of the lid. 6 | Pat on shade 5, the gold, in the inner corner and overlap over the first third of the lid. 7 | Use shade 6, the deep matte brown, in the outermost corner of the lid and blend slightly into your crease. 8 | Line your upper waterline and lashline with the black eyeliner, and blend out using the built in sponge. 9 | Top off the eyes with volumizing mascara. I added color and dimension with the e.l.f. Contour and Blush palettes, which have an awesome selection of shades depending on your mood. I opted for a peachy blush and strong highlight to boost my glow! 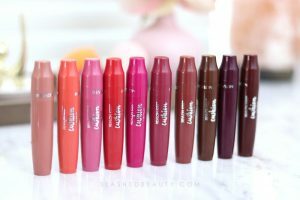 Finally, I finished with the Maybelline Super Stay Matte Ink in Believer, which is a bold matte liquid lipstick that lasts all day. It compliments the purple shade in the eyeshadow and really pulls the look together. This is a great look to try for yourself this fall— you’re not juggling too many products, and you get to work color into your looks in a wearable way. Plus, each product is so affordable and easy to grab on your next trip to the market! Don’t forget to stop by your local Kroger from September 27 – October 10 for the BOGO 50% off Beauty Event… I’ll definitely be stalking mine. Have you ever walked the beauty aisles at the market? Love this look! That lip color is goooorgeous on you. It’s one of my go tos! In my area I have Fred Meyer but it is owned by Kroger, so I wonder if they are having a sale too? Love this look so much!!! The lip color is a perfect addition too! This is interesting since I shop at Kroger often. I wonder if it will be at my local store. I’ve had my eye on that Maybelline palette. Pretty look, i love your eyes here. Pretty sure it’s nationwide! Mine has a great beauty section so I’m excited! I love that lipstick color so much! 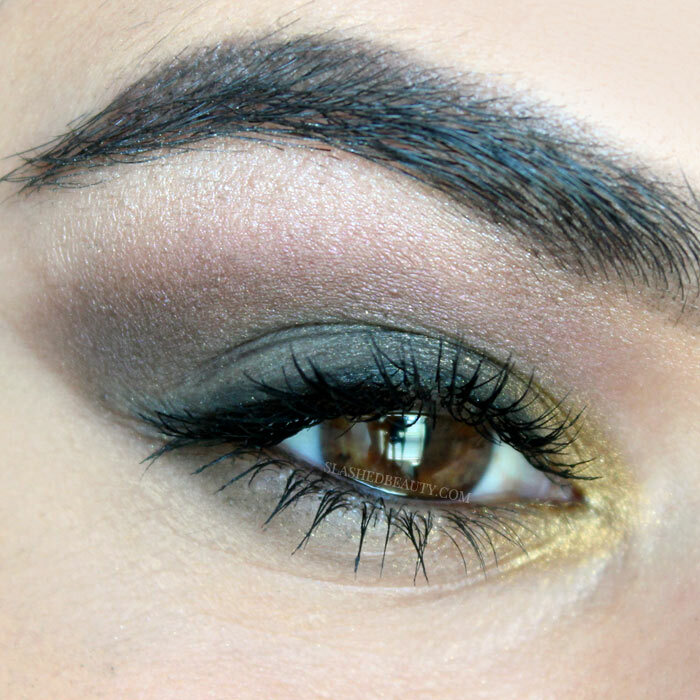 I have this Maybelline eyeshadow palette already and will definitely have to recreate this look! And what luck, I actually have this lipstick as well that I picked up a couple weeks ago! 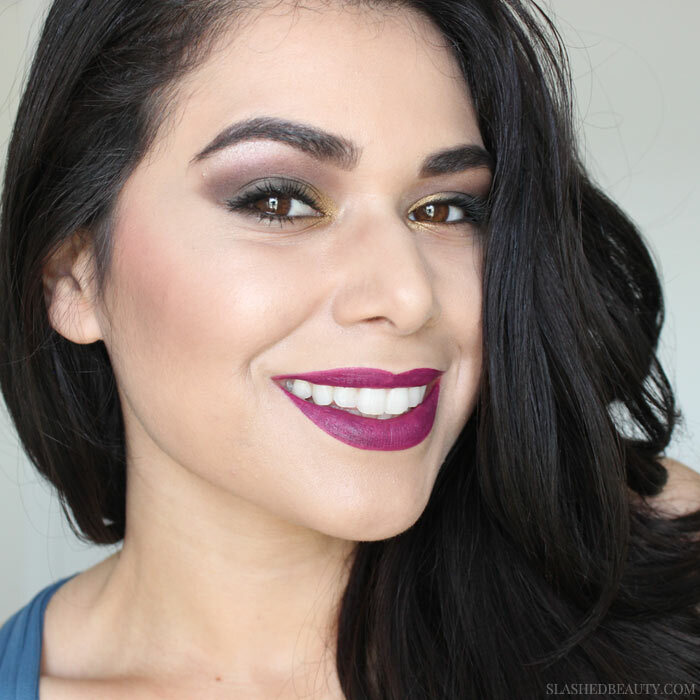 This is a really beautiful look for the fall!